Thread: What am I missing here??? I’m working on financials for our 2 BBL Nano startup, if anyone has a minute check out this google doc of P&L and let me know what you think. Thanks! Edit: added image files instead of a Doc link. Last edited by DTimblin; 04-02-2019 at 12:00 PM. Couple of quick things I noted. How did you go from producing 24BBL/month to 480BBL/year? Depending on your location and local beer scene etc, figuring on selling 285 beers every single day you are open may be on the optimistic side. Please try to start with a larger brew system than 2bbl. I reviewed your attachments. You are servicing a $150,000 loan at $3,000 month. A 2bbl system ain’t gonna cut it in the long run and will be brutal on your labor costs if you are the least bit successful. Please try to piece together something/build it yourself/frankenbrew some tanks etc. to get to at least a 5bbl system. Making your own frankenbrew equipment at the 5bbl size is easy and can be put together for around the same cost of a nice home brew system. Last edited by Catfish002; 04-02-2019 at 02:08 PM. 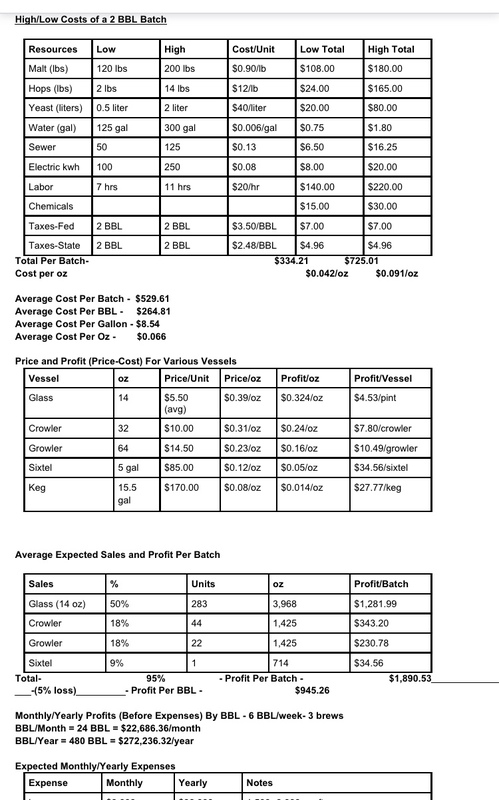 I ran the numbers at 3.5 BBL and 5 BBL and they definitely look better, I’m just looking to minimize my upfront costs and see if it’s viable as a start up. Fully aware that if we’re as successful as we hope, having a plan to expand the brewhouse and cellar would need to be in place for less than a year out from opening. Will your loan cover both your 2bbl system costs and your 5bbl-15bbl expansion system costs within a year? Not trying to be harsh...but wanting to stress if going into $150,000 worth of debt for an undersized system is really even a good idea. Last edited by Catfish002; 04-02-2019 at 05:22 PM. No problem being harsh, I’m looking for real opinions haha. 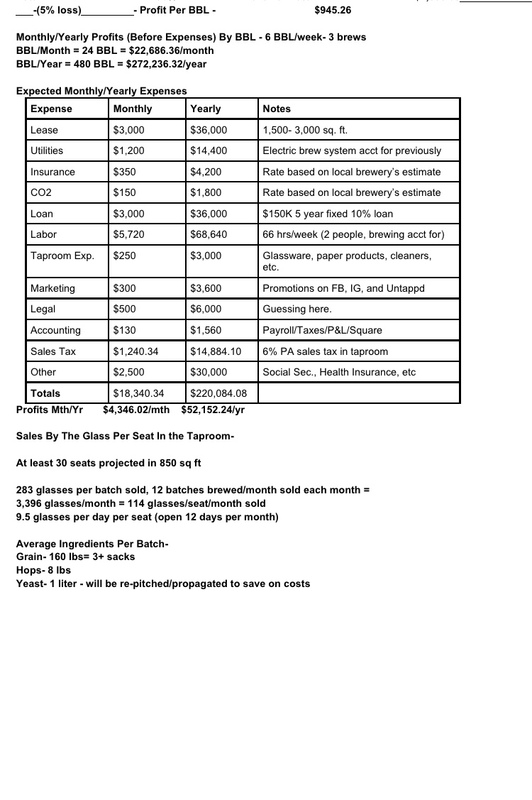 The $150K is a ballpark figure for equipment/startup costs/raw materials/taproom buildout. If I can get the number down lower I for sure will take out a smaller loan. A similar project here (South Central PA) got started with a 1 BBL system and small taproom for about $60K but they worked like crazy the last 8 months and are just installing a 3 BBL system this week. Feels like if I can start a little bigger than that, and then expand more exponentially, our project will have a better chance and less risk of myself and my brewing partner burning out. Debt kills small businesses. Avoid it or minimize it as much as possible. Don't open with a 2 bbl system, start at least at 4bbl size. We started at 4 bbl, and within 2 years upgraded to 7 bbl. Happy with 7 bbl production now, 4 bbl production was a struggle to keep up, and we are only a tap room with no meaningful distribution. Thanks everyone for the replies! I’ll probably go back at least to my 3.5 BBL numbers and see how they look with a smaller loan. Does anyone see any expenses or profits up there that seem wildly off? ?